Celiac disease and non-contaminated oats? As someone living with celiac disease, I am always trying to keep on top of what foods are safe to eat and which ones are not. The safety of consuming oats has been a controversial issue for people with celiac disease over the past decade. Australian researchers set out to examine why some people with celiac disease can tolerate non-contaminated oats while others feel sick. Seventy-three adults with celiac disease consumed 100 grams/day of non-contaminated oats for 3 days. The findings from this study revealed that while most of the participants could tolerate oats, 8% had an immune reaction to oats. 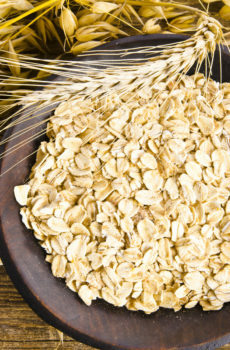 The authors concluded that oats are safe to eat for the majority of people with celiac disease. Interestingly, this study was published at the same time that Health Canada released its position statement on the safety of oats for people with celiac disease. The review by Health Canada highlighted that although a number of studies have identified some individuals with celiac disease who cannot tolerate oats (most often youth), the evidence suggests that the majority of people with celiac disease can consume non-contaminated oats without any adverse health outcomes. Experts recommend that before eating oats, you should be stabilized (ie no symptoms) on a strict gluten-free diet. Some people may initially feel bloated after they introduce oats (non-contaminated), which is most likely due to the fiber in oats and should subside after several weeks. If you still feel symptoms after eating non-contaminated oats after a month you may not be able to tolerate oats. Not sure what is causing your symptoms? Book an appointment with a member of our team to help you determine if sensitivity to oats is responsible for your gut related symptoms (e.g., bloating, constipation, diarrhea, gas, nausea).